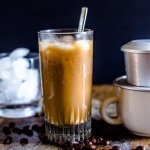 Most of Vietnamese ground coffee are the Robusta species which contains low acidity and high bitter sweetness and roast very dark, as in French roast. 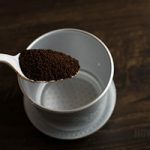 They are widely used for espresso and such types coffee, though on the market, most Vietnamese coffee brands would blend in a variety of fillers, a trend during World War II due to supply shortage but too memorizable to forget. In Vietnam, coffee is served at street stand and low-light cafe. 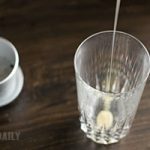 It’s a drink that’s more popular from early morning till noon. It is consumed as hot, ice cold and iced w/ milk. All required the same procedure of brewing with slight difference in water quantity. 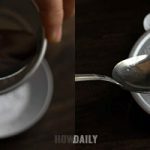 Hot coffee will have more boiled water added, while iced version required less water and higher coffee to water ratio. “Phin” is the name of the coffee filter that are used in Vietnam. The concept is similar to French Press, and the goal: the thickest coffee possible. A Phin is usually consisted of 4 main parts: the filter body, damper, base dripper, and lid. 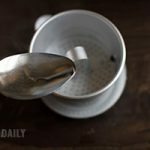 This brewing method take advantage of the natural water flowing pressure and gravity to slowly drip hot water through soak coffee particles. This brewing style is best used with dark roast bean, which all Vietnamese coffee is. 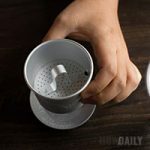 You can purchase Vietnamese coffee filter at most Vietnamese market or simply go online to Amazon or Ebay. 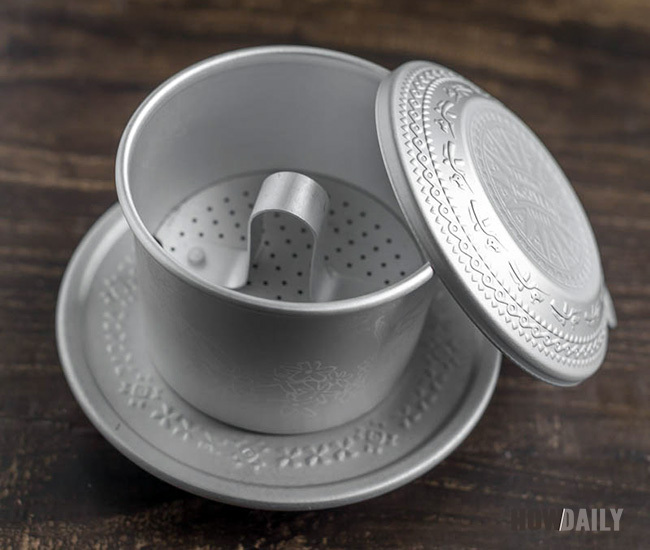 Choose the carefully crafted by Trung Nguyen in Aluminum for even and quick heat distribution. Be careful of those cheaply copies, cause in the case of filter, it’s totally a hit or miss. Those cheappies are really, well, either not dripping coffee at all or give you a cup full of coffee particles. So shop around before buying could save you a lot of frustration later on. 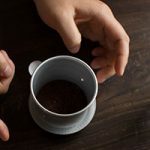 Coffee should be fun and enjoyable, not messy and yuck. 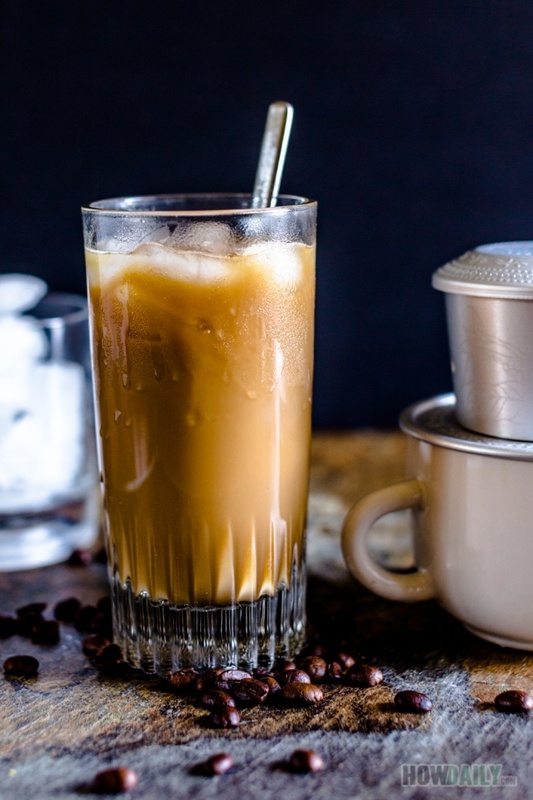 Follow this simple recipe below for your coffee journey to Vietnam. 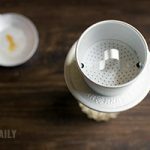 Rinse both the Phin - coffee filter and container cup with hot water. 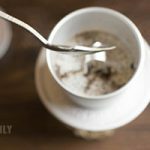 Stir your french roast coffee before scooping up a spoon into the coffee filter. Lightly shake and tap the filter body to remove air bubble within. Put the damper in the filter and tap lightly, do not over-press. 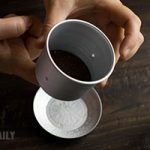 Use you finger or spoon to caress across the body filter's bottom to remove excess coffee particle. 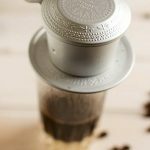 Place the body filter onto its base dripper. Pour 1 Tbsp of boil water into the base filter and let soak for about 20 seconds. Take 1 spoonful Tbsp of sweet condensed milk and add to your cup. 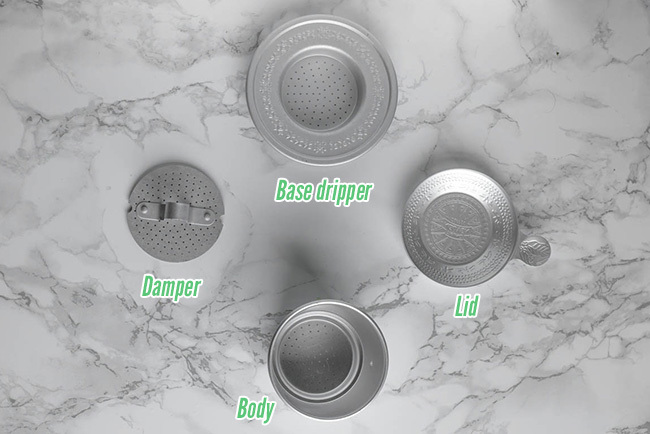 Now place the filter w/ base dripper onto your cup, lightly press on the damper again. Pour about 60ml of boiled water into the filter, cover its lid. Your coffee should starting to drip and be done in about 4-5 minutes. Now, just add ice, stir, shake and mix the whole thing up. 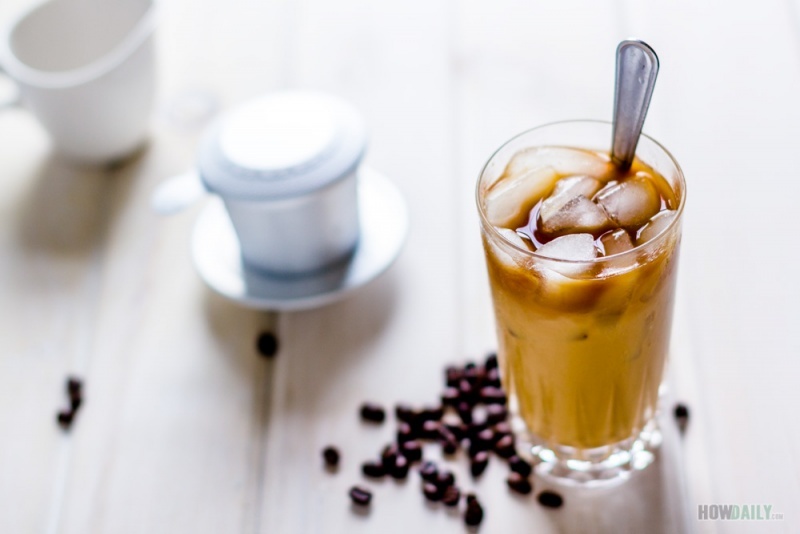 Your iced milk coffee is ready.